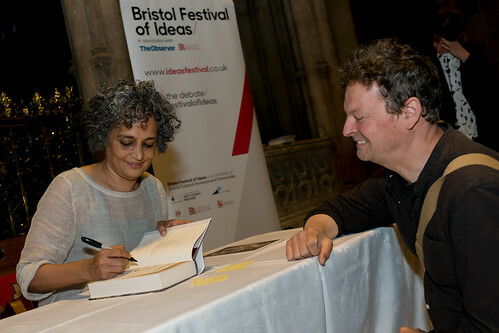 Since her first novel, Roy has been published five books of nonfiction including Broken Republic and Capitalism: A Ghost Story that cover a range of nonfiction, covering India’s 1998 nuclear tests, the rise of Hindu Nationalism, the armed Maoist insurrection in central India, the struggle for self-determination in Kashmir and US invasions of Iraq and Afghanistan. She has been jailed in the past for her views and is even now facing a trial for criminal contempt of court for an essay she wrote about an incarcerated college lecturer. Arundhati Roy is the author of the Booker Prize-winning novel The God of Small Things. She has written several nonfiction books covering environmental, political and human rights issues, including The Algebra of Infinite Justice, Listening to Grasshoppers, Broken Republic, Capitalism: A Ghost Story and, most recently, Things That Can and Cannot Be Said, co-authored with John Cusack. She has been jailed in the past for her views and is even now facing a trial for criminal contempt of court for an essay she wrote about an incarcerated college lecturer. Her latest novel is The Ministry of Utmost Happiness.